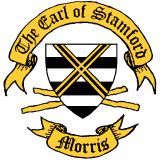 The Earl of Stamford Morris is a traditional mixed morris side based in the Cheshire village of Moore (now in Halton Borough), which is roughly halfway between Warrington and Runcorn. We dance mainly in the Cotswold morris style. This year we are concentrating on dances from Badby, Fieldtown, Adderbury, Oddington, Ilmington, Lichfield and Upton on Severn. Between September and May we meet for practices every Tuesday evening at 8pm at the Milner Institute, Runcorn Road, Moore — use postcode WA4 6UN for the car park at the rear by satnav — and perhaps afterwards at a local pub. In the summer we dance out once a week at pubs across the region, often with other morris sides. We perform at various events and also hold occasional ceilidhs and morris dancing workshops. If you would like to book us for your event, please contact us. The Earl of Stamford Morris has been performing since the 1982-3 season and is a member of Open Morris, whose current chair is in the side. We revived the Halton Souling Play in 2000. We now perform it at various venues every year in early November, around All Souls Day.